The past week has been all about balancing writing deadlines with kids' activities. Although my husband is home for the summer, I try to make it out to swimming lessons and soccer games whenever possible. The combination of work to be done and a family home for the summer has resulted in simple, quick meals. Something's gotta give, I always say. 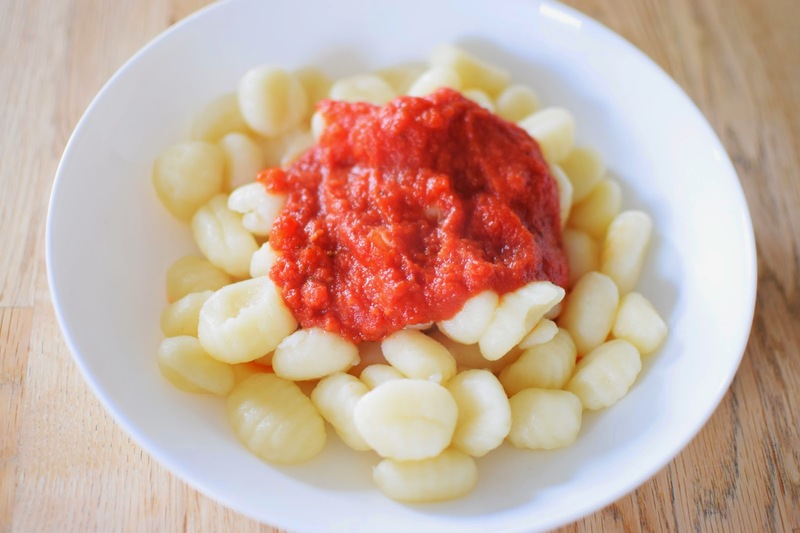 We had potato gnocchi with homemade tomato sauce one night. Probably a green salad that I forgot to photograph too. We've been having lots of quick green salads. 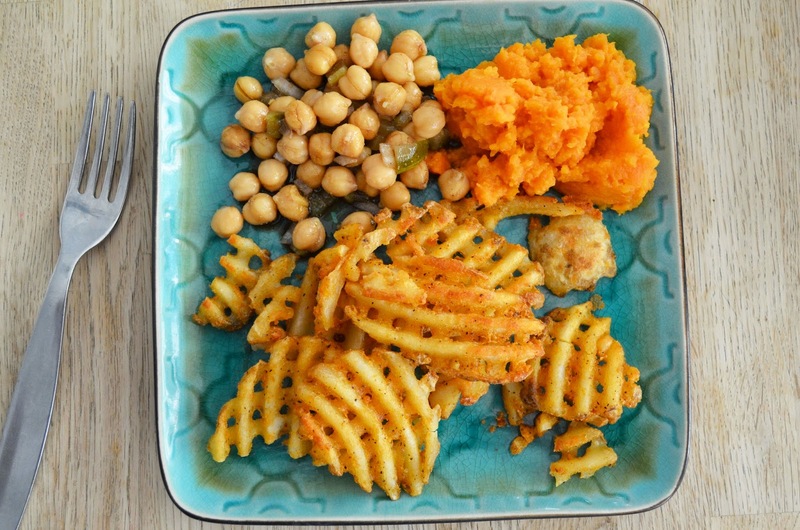 My husband put waffle fries in the oven one day and made a chickpea salad and sweet potato mash. I confess I ate far too many of those waffle fries! 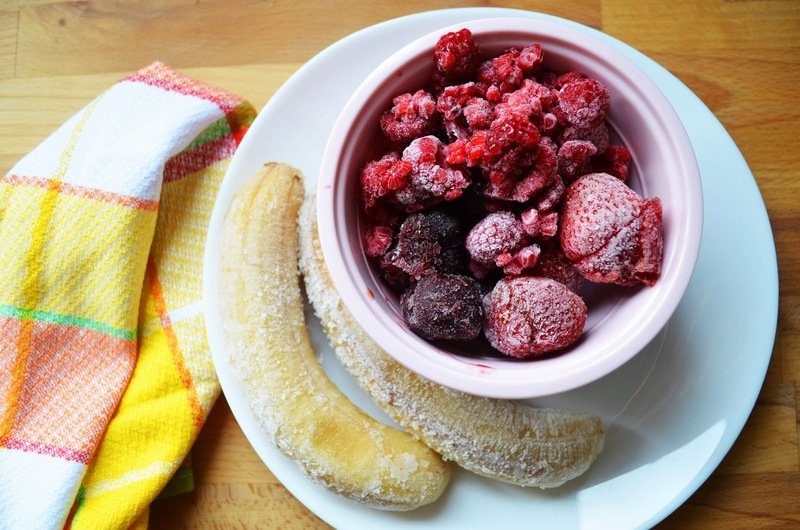 My Tuesday meals started with a breakfast treat of frozen bananas, cherries, strawberries and raspberries, run through my Yonanas healthy treat maker. It results in an ice cream-like bowl of goodness that feels naughty for breakfast. But it's all fruit! 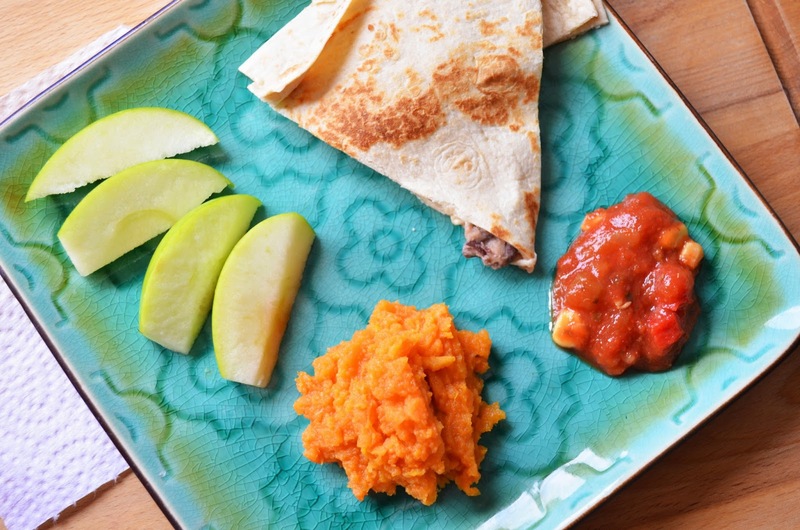 Lunch was Daiya vegan cheese and bean quesadillas with salsa, sweet potato mash and sliced apples. 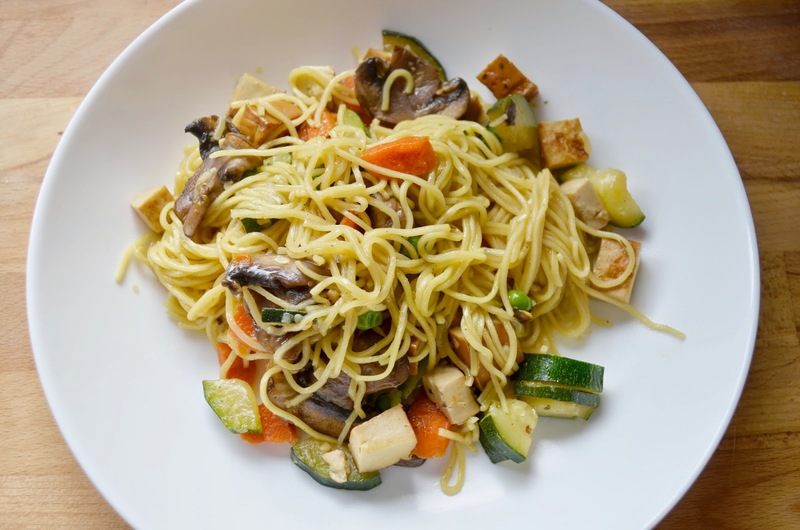 For dinner, my husband whipped up noodles with stir-fried veggies and tofu cubes. In the evening, I indulged in a So Delicious coconut almond mini frozen dessert bar (not shown). So good! What about you? Are you whipping up simple meals or going gourmet this season? 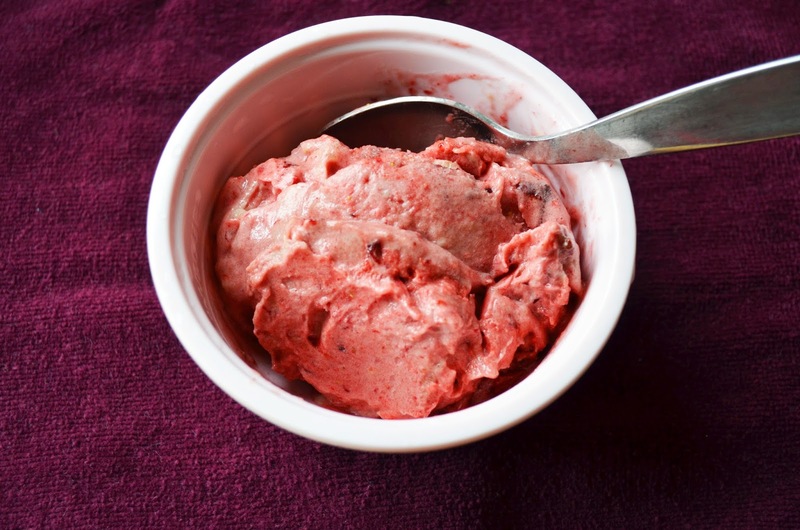 Yonanas is great, but how do you get the 'ice cream' to look all properly mixed? When I did banana and berries, it was a very distinct yellow vs purple colour, nothing like the recipe booklet! I've been looking for vegan gnocchi and ravioli but they're always really expensive so I get determined to make my own but never do! I alternate it like the instructions say - one banana, berries, another banana - and then just stir it all together in a bowl. Nice combo for the Yonanas! Green salads-- lots of those! With all the fresh veggies available, they are a summer staple as a side and main dish. Everything you cook looks so yummy! I need to get more adventurous with my green salads! Yum! Do you eat frozen bananas straight up? I love the idea, but they're always too firm for me. We are keeping it simple lately (too simple, I need to step it up!). No, I never eat them frozen straight up. I like the banana flavour better when mixed with some other fruit, whether in a smoothie or Yonanas.